As I rose this morning, I heard the word or phrase (DO-OVER). The Father says, “I AM going to do a “DO-OVER, WITH YOU.” So quiet yourself before the Lord, and prepare for your DIVINE DO-OVER. A do-over, meaning, a new attempt or opportunity, to do something, after an earlier attempt has been unsuccessful or unsatisfactory. “ARISE [from the depression and prostration in which circumstances have kept you–rise to a new life]! Shine (be radiant with the glory of the Lord), for your light has come, and the glory of the Lord has risen upon you! (Zechariah 8:23.) For behold, darkness shall cover the earth, and dense darkness [all] peoples, but the Lord shall arise upon you [O Jerusalem], and His glory shall be seen on you. (Isaiah 60:19-22; Malachi 4:2; Revelation 21:2, 3.) And nations shall come to your light, and kings to the brightness of your rising.” (Isaiah 2:2, 3; Jeremiah 3:17. Isaiah‬ ‭60:1-3‬). In My Do-Over, I don’t just give back what you have lost, but I give that back, and MORE THAN YOU ASKED FOR. A fresh attempt to succeed and thrive moreover. Assured God will also supply the provision. Thus we arise, shine, and act on our decision. We have won the battle, no matter how intense. As we act on the Word in its simplicity. God provides not just a second but another chance. 20 The beast of the field shall honor me, the dragons and the owls: because I give waters in the wilderness, and rivers in the desert, to give drink to my people, my chosen. That we might behold the wonders of this new thing. As God shall make a highway in the wilderness. 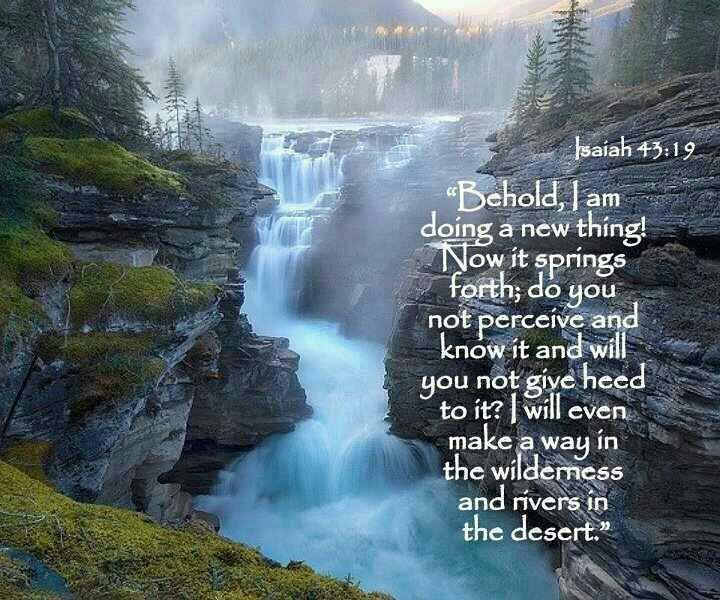 To bless and refresh with rivers in the desert. He chose us and set us apart to show forth praise. He has prepared to bring forth life-changing seed. As we enter the New Year, we may encounter challenges and difficult situations that seem impossible to resolve on our own. The Bible reminds us of God’s unfailing power and strength to turn a seemingly impossible situation into a triumphant victory. We must never forget the message of Isaiah 43:19. What a wonderful reminder and source of encouragement as 2013 ends and 2014 begins.